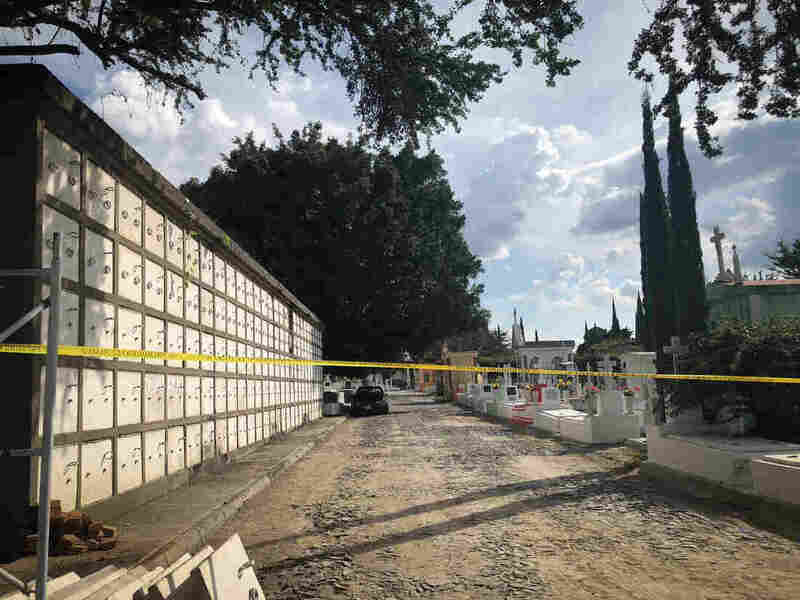 Mexico's Morgues Are Overflowing As Its Murder Rate Rises Several cities have resorted to storing dead bodies in refrigerated trailers, including Guadalajara. That sparked a national scandal, after some residents complained about the stench. A site in a Guadalajara cemetery last week, where the state wants to bury the bodies that are currently stacked up at the local morgue. Authorities say there are two trailers packed with human remains, and dozens more bodies stacked up in the city's morgue. They say there are 444 in all. Some of the bodies have been in storage for more than three years. The trailers are now back at the morgue. And María del Rosillo Limón Maldonado says the whole place reeks of death. Maria del Rosillo Limon Maldonado's daughter Paulina went missing in 2015 when she was 19 years old. "The smell penetrates you, totally envelops you," Limón says, standing in front of the huge stark white building. Limón and her husband are from the state of Puebla and saw news of the trailers on TV. Their daughter, Paulina, has been missing since 2015. She was 19 at the time and 4 months pregnant. They think that maybe her body is in one of the trailers. "We have seen so many bodies during these long three years searching for her," says Limón. People from all over Mexico have flooded to the morgue in Guadalajara in search of their relatives. About a hundred show up every day. Homicides are at record rates in Mexico. Nearly 30,000 people were murdered last year. This year is on track to be worse, with more than 33,000 homicides registered by the end of August. This major traffic roundabout in Guadalajara contains several banners of missing people. It has been renamed the "Roundabout of the Disappeared." 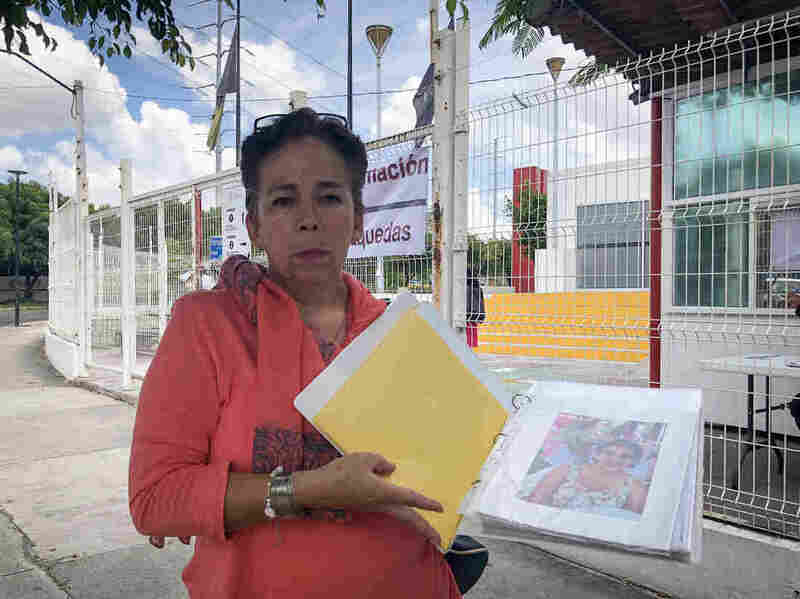 María Ramos also waits outside the huge Guadalajara morgue. Her 34-year-old son went missing in October. She says authorities took her DNA sample back then, but according to the news reports she's seen, they haven't done anything to identify the hundreds of bodies inside. "How am I ever going to find my son?" she sobs. "I feel so helpless and furious at the same time." The morgue's new director, Carlos Daniel Barba Rodríguez, says he has a lot of work ahead of him. "I will have to get done as quick as possible, all the work that these people didn't get done in the last three years," he says in an interview in his office. The overwhelming stench of the trailers permeates the walls. Five officials, including the past director, have been fired since the trailers were discovered and the scandal erupted. The governor has given Barba Rodríguez until Oct. 15 to clear the bodies out. "We'll do everything we can to make that deadline," he says, but he adds they will take the necessary time to do it right. Confusion over a new law prohibiting the cremation of crime victims caused the backlog, says Barba Rodríguez, along with negligence by the former director. Calls to that former director weren't returned. He has denied any wrongdoing. Barba Rodríguez says once proper identification of the bodies is done, they can legally be interred. 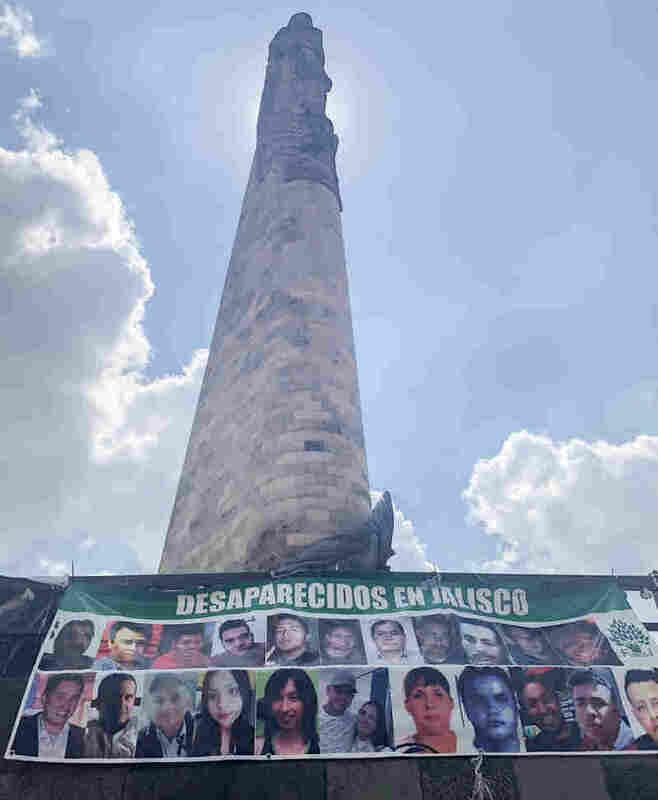 But officials in Guadalajara face another problem — the seemingly endless arrival of new bodies. 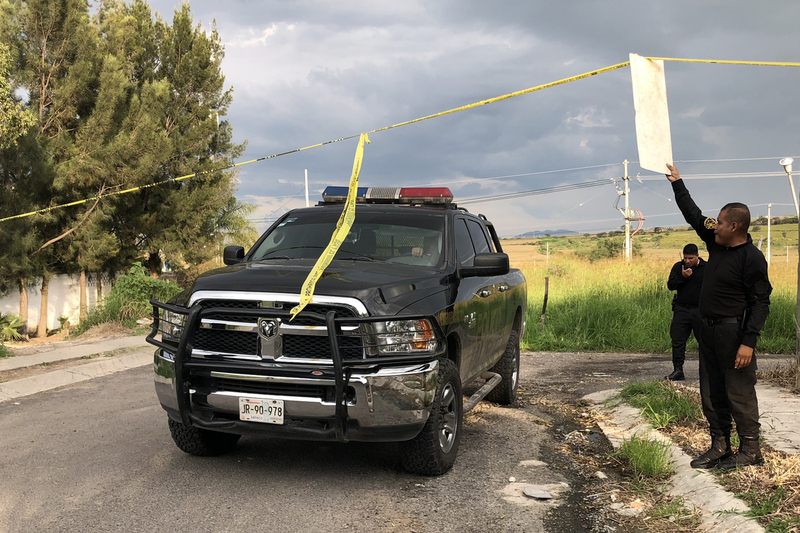 In a hillside neighborhood on the outskirts of Guadalajara, police officers climbed into their truck and drove out of Robles on a recent night. They just finished recovering four bodies from a clandestine shallow grave in an empty field behind the rows of houses. "We are no longer known as Robles, now it's the Robles graveyard," says a resident who would only give me her first name, María. She says she's scared of the drug gangs that are dumping bodies here. Homicides have exploded in the state of Jalisco, home to the country's now largest and most vicious drug gang, the Jalisco New Generation Cartel. Last year more than 1,300 murders were reported in Jalisco. This year's figure already tops 1,400. Maria del Transito Zamora's son was the first person identified out of the 444 bodies in the morgue. Meanwhile, workers at one of the city's largest cemeteries are quickly building rows of concrete crypts for the hundreds of bodies still at the morgue. Dozens of bodies have already been placed here, including those from families that can't afford a funeral, like María del Transito Zamora. Her son was one of the first identified among those in the morgue. 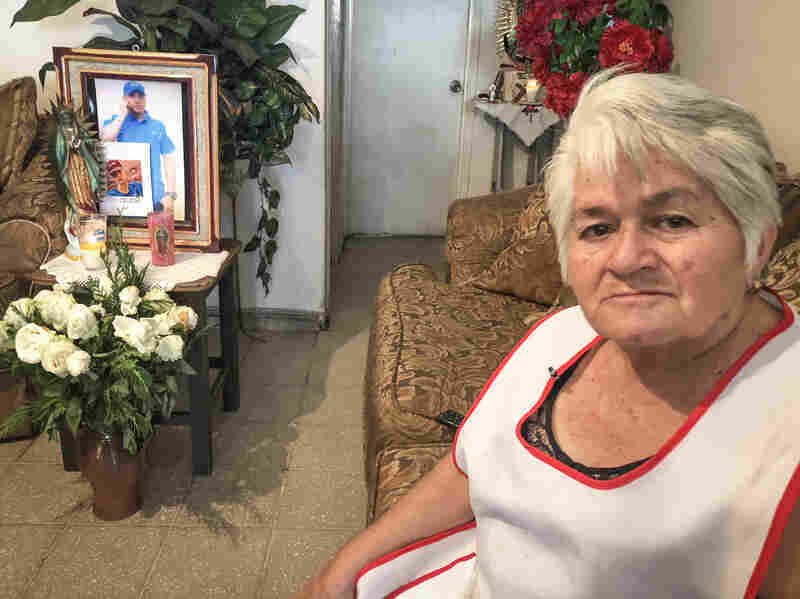 "I wanted to have the funeral here at my home," she says in the living room of her small residence, where a picture of her son and grandson are surrounded by white roses and votive candles. But the 68-year-old mother and grandmother says the authorities, who only paid for the crypt interment, wouldn't allow it. It took Transito Zamora months to get her son's body out of the morgue. She's still waiting for authorities to allow her to give her grandson a proper goodbye. Both men were abducted together earlier this year, but she says officials still haven't figured out which body is her grandson's among the hundreds still at the morgue. Police at the site of a clandestine narco grave in the Robles neighborhood on the outskirts of Guadalajara last week.